I came up with this chicken recipe a couple of months ago when (as usual) my pantry was not well-stocked enough and all I really had on had were some onions and a can of corn. I made it and I liked it but I put way too much consomme mix in, and it just dominated the sauce. So, this was primarily another shot at the recipe with the seasonings mellowed out a little bit. The sauce was not bad, but it could have used a little more flavor from something else, and definitely some more color besides just the yellow of the corn. The biggest problem I had with the chicken this time though was the texture. Just like the last time I made it, the coating was mushy, and I'm not sure it was flavorful enough. The cornflake crumb mush just slopped off the chicken with the corn sauce, which was extremely unsatisfying. I found myself eating this mass of cornflake globs with the corn sauce...the taste wasn't too bad, but it wasn't the kind of thing I'd be prepared to served to a large crowd. Here's what I would change: I would add another vegetable to the sauce, possible diced tomatoes, as well as maybe a green bell pepper (or even jalapeno possibly). I kind of want it to be more of a salsa than a sauce, and maybe give the dish a little more of a Mexican flair. I would also definitely change the primary cooking method of the chicken. Baking it covered just plain didn't work. Baking it uncovered without the sauce first might be a step in the right direction. Another step might be to bake it uncovered on a cooling rack on top of a baking sheet, to allow both sides of the chicken to crisp up. But really, my gut feeling tells me this chicken is meant to be sautéed. A preliminary experiment with frying the leftovers definitely yielded better taste, but it was too late to see the effect it would have on the texture since it was already cooked. I'm pretty confident though that frying the chicken first will crisp it up nice and golden brown, and then cooking it with the sauce might be the right way to do this. So, try this beta recipe at your own risk, or even better, improve it and let me know how you fixed it up! 1. Mix mayo, mustard, paprika and honey garlic spice together in a small bowl, and lay corn flake crumbs out on a plate. Dip chicken breasts in mayo-mustard sauce till well-coated, then coat in corn flake crumbs. Set the chicken breasts aside in a dish. 2. Saute sliced onions and garlic in olive oil over medium heat until translucent. 3. Deglaze the pan with white wine, then add corn, marjoram, coriander, chicken soup mix, salt & pepper. You might need to add a little bit of water too if there is not enough liquid in the pan - but no more than half a cup. Cover and let simmer over medium heat until most of the liquid has reduced. 4. 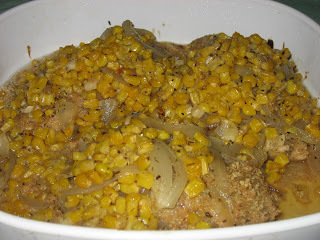 Spoon corn sauce over chicken, cover and bake at 350 for 30-40 minutes or until done.